LARGER THAN AVERAGE - 1347 SQUARE FEET- an exceptionally spacious semi detached family home within close proximity to village amenities. This property originally comprised a traditional turn of the 20th century house which has since been substantially extended to the rear within the last ten years, approved by Wealden District Council (application number B/078/1452), and now has generous downstairs living space and three good sized bedrooms on the first floor. The interior of the house is light and well arranged with fabulous Kitchen/Family Room, with an overall length of over twenty nine feet, at the back of the property having casement doors opening to the rear garden. The Kitchen has solid wood flooring with underfloor heating, and is exceptionally well equipped with a good range of cupboards, drawers and Quartz work surfaces. The original Living Room is to the front of the house with a south facing aspect, and there is also a downstairs Cloakroom off the Entrance Hall. 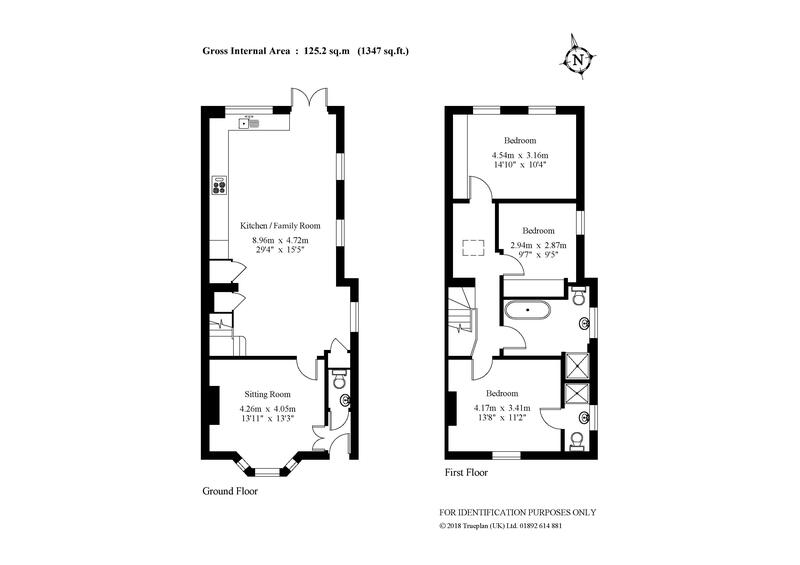 On the first floor the enlargement of the property has created three double Bedrooms, a new bathroom including a shower cubicle and bath, and an en suite Shower Room off Bedroom 2. Outside to the front there is Off Street Parking for two cars. To the rear of the property is a long fenced garden laid to lawn with a large paved Terrace. In addition there is a Garden Room/Studio measuring 14' x 13'10 with light and power. Ideally located in an established street in the village of Forest Row this well positioned semi detached house is within one third of a mile of the village centre and local primary school. The house stands on a south facing plot in a non estate positon. Forest Row has an exceptionally wide and varied range of local shops, specialist stores, restaurants, cafes and galleries. Currently the village offers free parking and caters for most everyday shopping needs. Regular bus services operate through the village to the nearest town of East Grinstead and the further towns of Tunbridge Wells, Crawley and Haywards Heath all of which provide more extensive shopping/leisure amenities and rail services to London. Gatwick Airport/Station and the M23 motorway are within fifteen miles. The area is well represented for both state and private schools including Sackville College, Ashdown House, Brambletye, Michael Hall Rudolf Steiner and Greenfields all within a few miles. Recreational facilities locally include Lingfield Park and Brighton Racecourses, East Sussex National Golf Club at Uckfield and the Amex Satdium at Brighton home of Brighton and Hove Albion Football Club. The Bluebell Steam Railway can be boarded at East Grinstead travelling down to Sheffield Park. There are a number of landmark properties located in the local Sussex/Kent area including Hever Castle, Groombridge Place, Sheffield Park Gardens and Wakehurst Place.